Reverend Martini, Rockin’ Vic, Astro 138, Howie Pyro and Phast Phreddie the Boogaloo Omnibus swing at the Hop ‘n’ Hang! Last week, Phast Phreddie the Boogaloo Omnibus was in the process of a deal to procure a much-desired 45 RPM record from DJ Astro 138. When Astro 138 discovered that The Boog was going to be in LA, he asked The Boog to come DJ with him on December 26 at Viva Cantina in Burbank. The Boog is always happy to spin a record or two, so he accepted the invitation. The night was called Hop ‘n’ Hang, hosted by the lovely Reverend Martini, and it was held in the back room of a wonderful Mexican restaurant. DJs Rockin’ Vic and our pal Howie Pyro joined Astro 138 and The Boog in the playing of fabulously greasy R&B, salacious rockabilly and assorted walloping madness. 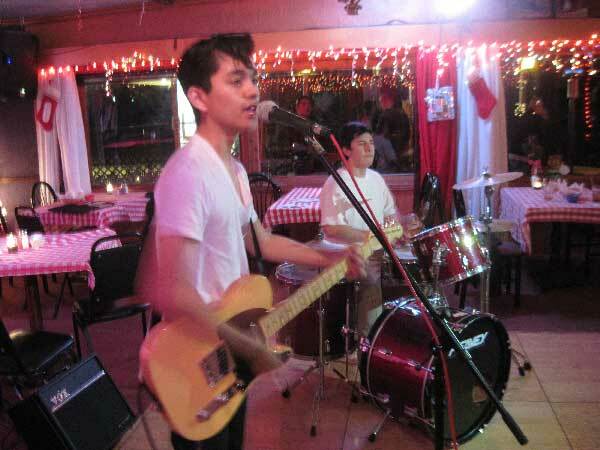 The secret weapon of the evening was The Arial Chemists, a duo of teenage boys who opened its set with “Sweet Jane” followed by “Voodoo Chile.” Just a guitarist and a drummer, but they made an enthusiastic and righteous noise that was greatly appreciated by those in attendance. The Arial Chemists rock the Hop ‘n’ Hang!